For the first time ever, the Sixpence Early Learning fund will fund collaborations between school districts and licensed child care providers. These new Child Care Partnership grants will give more of Nebraska’s most vulnerable babies and toddlers access to high-quality early learning experiences, which can help put them on par with their peers when starting kindergarten. Nearly 30,000 infants and toddlers in Nebraska face risk factors that can increase their likelihood of entering school one to two developmental years behind their more advantaged peers. To help these kids keep pace in Nebraska’s classrooms, school districts have committed funding and personnel to early learning, but often with mixed results. Sixpence funding represents a commitment to very high-quality early learning. It’s this quality, studies show, that makes the difference for kids starting at a disadvantage. This new stream of funding will empower schools to partner with Child Care providers to offer full-day, year-round services to at-risk families with very young children. Participation in the new Sixpence grants will give local child care providers access to funding, training and expert consultation designed to help them meet the quality requirements expected of Sixpence programs. The grants are the outcome of the passage of LB547 in the Nebraska Unicameral this past spring, which addressed technical restrictions that have prevented licensed child care providers from participating directly in Sixpence partnerships. The legislative effort to make this funding opportunity possible was led by Senator Kathy Campbell, Chair of the Health and Human Services Committee, and Senator Kate Sullivan, Chair of the Education Committee. Bornemeier says that the new grants will also require child care providers to enroll in Nebraska’s rapidly growing Step Up to Quality rating and improvement system. Step Up to Quality, a collaboration between Nebraska’s Department of Education and Department of Health and Human Services, provides training, opportunities for professional development and coaching for participating child care programs and staff. 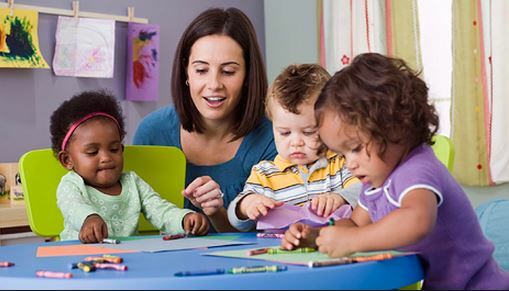 Step Up to Quality also uses rigorous assessments and quantifiable data to improve child care environments, educates parents on how to recognize quality child care settings in their communities and involves them more closely in their children’s early learning experiences. Grant applications are due by Thursday, January 28, 2016. View the RFP now on the Sixpence website. The Sixpence Early Learning Fund is a public-private partnership administered through the Nebraska Children and Families Foundation. By investing in the early years, we ensure that children who are at risk in Nebraska have the best opportunity to succeed in school and throughout life. We do this by funding a range of services including home visitation (supporting parents in their role as a child’s first teacher) and center-based services that offer safe, responsive and stimulating environments.